Question: I want to design a large mural on which 800 people can make a mark, using some of the markers sold on this website. It will happen in an indoor space, and be hung as a mural or banner at the end. What kinds of materials, surfaces are best for something this big? Canvas? Want else? It has to be heavy enough to hang, and to last. Tyvek? Any help is welcome. AP Reply: Look into Muslin. Its commonly used in Scenic Art (theater backdrops) It will be lighter and will take the paint very well. 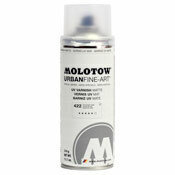 I would us the Molotow Oneforall Markers. They will be perfect for it.